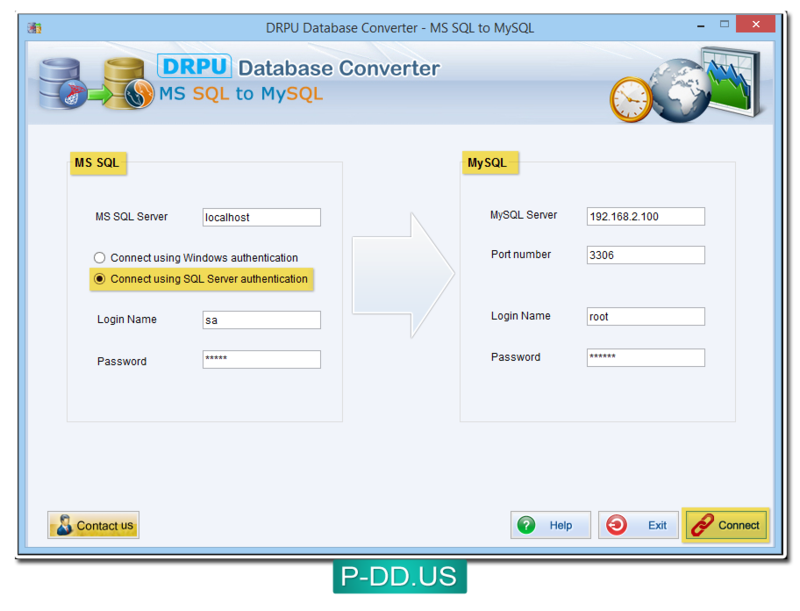 DRPU database converter – MS SQL to MySQL allows you to convert entire or selected MS SQL database into MySQL database and support all major data types with all necessary attributes. Software provides option to select schema items either automatically or manually. MS SQL to MySQL database converter tool works with all versions of MS SQL and MySQL server. Database translator utility supports all major database datatypes, attributes, key constraints, and default value constraints. Affordable MSSQL to MySQL Database migration tool facilitates to overwrite converted database with existing database or saves converted database at user specified location. Database converter utility provides user friendly interface and does not require any special skills to use the database conversion tool. Connect MS SQL and MySQL database converter using SQL server authentication. Convert entire or selected MSSQL database records into MySQL database according to user’s choice. Support all database datatypes, indexes, primary keys and default value constraints. Facilitate to overwrite converted database records with existing database or saves converted database records at user specified location. Fully support database Unicode architecture and maintain database integrity. Support all major versions of MSSQL and MySQL database server.